Happy last Friday of summer. Today's issue is shorter than normal as no doubt many of you are heading out early to enjoy the three day weekend. 1 big thing: China foresees new Cold War with U.S.
A senior official from the State Council's Development Research Center is arguing that President Trump's trade war is part of a broader plan to contain China. Driving the news: The U.S. is expected to impose tariffs on another $200 billion of Chinese imports as soon as next week, Bloomberg reported yesterday, with no denial from Trump. “With the US labelling China as a strategic rival, Sino-US relations will experience a deep structural change,” he said. “As two major powers, it is normal for China and the US to engage in both cooperation and competition … We should abandon our illusions in facing the [trade] war, while at the same time remain rational and work hard to maintain overall stability.”.. The bottom line: Both sides look to be preparing for a much more contentious relationship. Go deeper: The coming yearlong U.S. trade war with China. 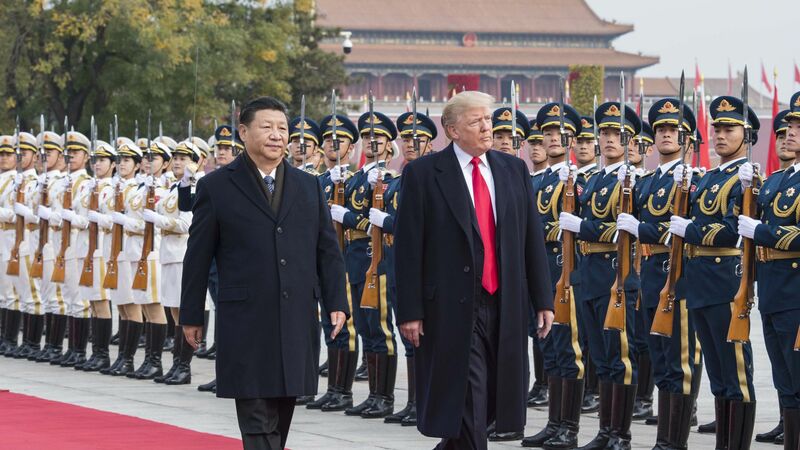 Robert Sutter, a long-time government official who is now a professor at George Washington University, says the 115th Congress has "broken the mold" for dealing with China, showing "widespread support" for a harder line from President Trump. Why it matters: The Chinese are not wrong — there really has been a structural shift across the U.S. government in policies towards China. The Chinese have been slow to grasp this change. This Congress has broken the mold of past practice where the US Congress more often than not since the normalization of US relations with China four decades ago has served as a brake and obstacle impeding US initiatives in dealing with China. That pattern saw repeated congressional resistance to administration efforts to advance US engagement with China at the expense of other US interests that Congress valued such as relations with Taiwan and Tibet, and human rights. Today’s congressional-executive cooperation rests on the Trump administration’s overall hardening of US policy toward China. Congress is responding with widespread support and asking for more. Notably, Congress strongly backs the Trump administration’s push for greater military, intelligence, and domestic security strength to protect US interests abroad and to defend against Chinese espionage and overt and covert infiltration to influence the United States. It opposes perceived predatory lending of President Xi Jinping’s signature Belt and Road Initiative and Chinese expansion in the South China Sea. It seeks greater protection against Chinese efforts to acquire advanced US technology companies in pursuit of economic leadership in these fields. And it presses for greater US support for Taiwan. Go deeper: Read Sutter's full post. Among 18-29-year-olds, 49% view China favorably and 36% unfavorably (+13), compared to a 38%/47% (-9) split in the country for all adults, according to a new Pew survey. The Chinese leadership held a symposium earlier this week to mark the fifth anniversary of the launch of the Belt and Road Initiative (BRI). The BRI has come under much criticism recently for saddling target countries with significant debt for too many economically wasteful projects. The BRI was written into the revised Constitutions, got heavy billing at the recent Foreign Affairs Work Conference, and is clearly a signature initiative of Xi that, like Made in China 2025, is not going away. The bottom line: The official Chinese report 习近平：推动共建“一带一路”走深走实造福人民 on the Monday meeting makes clear that the scope of the broader geopolitical ambitions remains essentially unchanged. It also places the BRI within the context of the major changes and adjustments underway in the international order — plus the resulting historical opportunity for China. Go deeper: China's grand infrastructure plan has spooked its rivals. "The Story of Yanxi Palace", a Qing Dynasty era costume drama set in the Forbidden City, has broken records for online viewership in China. By the numbers: iQiyi announced in a press release today that the 70 episode series has been streamed over 15 billion times. It was streamed an average of 300 million times a day, with more than 700 million views on its peak day. Watch it: All the episodes are on YouTube here. Go deeper: Pandaily writes Yanxi Palace Puts Feminist Spin on Chinese Historical Drama. Thanks again for reading. Don't forget to check out my daily Sinocism China Newsletter and follow me on Twitter @niubi. Happy Labor Day!